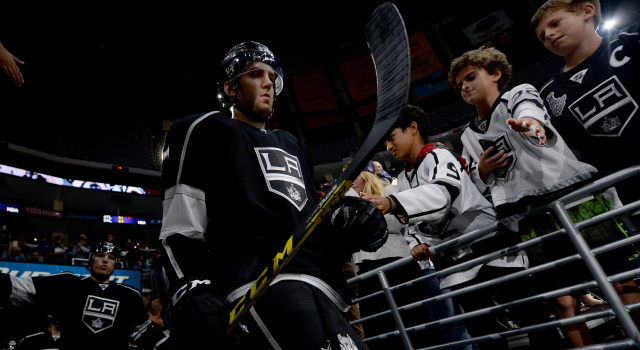 As expected, the Los Angeles Kings recalled defenseman Derek Forbort from AHL-Ontario early Sunday. Forbort, who registered seven shots on goal during Ontario’s twoovertime losses to the San Antonio Rampage, did not travel with the Reign to San Jose for today’s game against the Barracuda and was on the ice with the Kings at Sunday’s practice. His Ontario assignment was meant to keep him game sharp and was not based on anything related to Matt Greene, who is on injured reserve but improving in his attempt to return from an upper-body injury. Forbort has been held scoreless in two games with the Kings this season. The recall was also not related to Christian Ehrhoff’s status, though Ehrhoff, who did not return to the game after a second period Mike Ribeiro boarding minor in Saturday’s win over Nashville, participated in Sunday’s practice at Toyota Sports Center. We’ll speak with the veteran defenseman shortly. Los Angeles’ practice is wrapping up; the team will travel to Chicago shortly after its conclusion.